At the beginning of summer break this year, I decided to endeavor to read the Little House series to my three daughters. I have such fond memories of reading these books when I was growing up, and I’ve been waiting for a while, actually, for my girls to get to an age where I thought they could appreciate the adventures of a frontier girl that I so loved as a girl. This undertaking, it turns out, is taking quite a bit longer than I had anticipated – given that it took us me from June until the end of October to get through the first two books. Two of my three girls lost interest quite a while back; it’s possible they’re still too young to appreciate Laura Ingalls Wilder, I suppose. Or maybe its’ not their age, but their general interests; maybe girls nowadays, in the age of all things technologically advanced, are just not interested in the quaintness of frontier living. I don’t know. In any event, only one of my daughters (age 7) has stuck with me on this. So we curl up in a cozy chair and I read aloud to her, a chapter at a time. But not every night, because life is full and busy and I often just fail to make the time for simple pleasures like this. Which is the main reason it’s taking so long to get through these books. 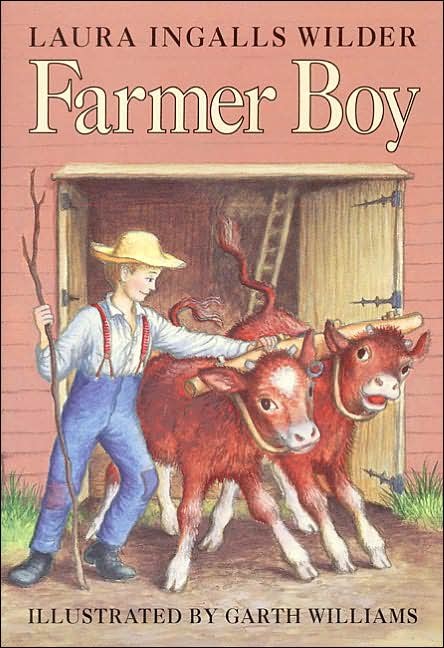 Anyway, Farmer Boy is the second of nine books in the series, and the only one devoted to telling of Almanzo Wilder’s (Laura’s future husband) childhood. Growing up on a well-to-do farm in upstate New York, young Almanzo pines for a colt of his own, but Father doesn’t think he’s old enough or responsible enough. Throughout the book Almanzo tries to prove himself, and along the way we get a window into his life: going to school part of the year, helping plant and harvest crops, hauling timber, and caring for livestock. Even for a well-to-do family, there is much manual labor to be done, and everyone must pitch in. I have to say that the thing that probably intrigues me the most are the frank descriptions about discipline and how children were expected to behave back then. Such a departure from what is expected of kids nowadays! Imagine a child knowing they must behave and not whine or complain for fear of getting their hide tanned! I kind of think tanning of hides needs to make a comeback! A lot of it was tedious reading, I’m sad to say. Some of it reads almost like an instruction manual; I swear I could build my own bobsled from the ground up with the detailed descriptions outlined in Farmer Boy. This made it feel like somewhat of a chore to read. Still, at the end when Almanzo finally gets his colt, I had trouble reading aloud because of the hitch in my throat. We’re moving on to the next book now, Little House on the Prairie, and hoping for a little more excitement. Of all those books, this one is by far and away my favorite! I probably read it a dozen times over the years. My favorite parts were always the descriptions of the food, fried apples and onions and pancakes with brown sugar between the layers. I too think I could build a bobsled or even cut ice from a lake from the descriptions in the book. LOVED it! Farmer Boy is one of the best books in this wonderful series. Reading it as an adult, I can see that these kids lived a charmed life compared to the Wilders. These were the established well-to-do farmers, as opposed to the life that the Wilders were barely scraping out for themselves on the frontier. A new essay about Laura Ingalls Wilder, Almanzo Wilder and Rose Wilder Lane, is now available as a Kindle E-Book! Based on a scholarly paper written for University of Connecticut, author Wayne Jebian examines the roles played by Laura, her daughter, Rose, her husband Almanzo, and her parents in the creation of the best-selling “Little House” series of books.